I never met Ant Hayes. However, having spent a couple of hours reading some of his work and learning what others thought of him, learned from him and how they remember him, I'm pretty sure we'd have got along just fine. I'd probably have annoyed him with all my questions but from what I've read, he wouldn't have tired of answering them, especially if they were on his favourite subject - English Brown Ales. Ant was a South African who moved to London with his family in 2005, bringing with him his passion for home brewing and going on to become one of the founding members of London Amateur Brewers. 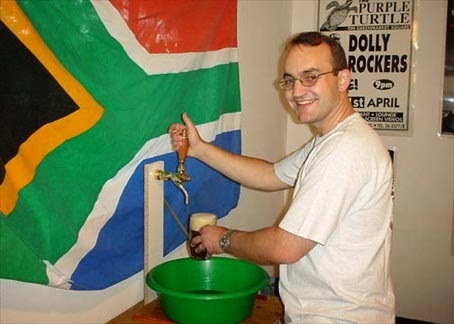 He was well known in home brewing circles world wide, having facilitated the first BJCP judging exams to be held outside of the United States (in South Africa) and the first exams in the UK. He also had work published in Zymurgy, including this fantastic article on Burton Ales, co-written with Martyn Cornell. Ant was so passionate about English ale styles that, when visiting the US to attend the American Home Brewers Conference in 2009, he flew examples of English Brown Ales over in order to demonstrate his view that the BJCP guidelines did not reflect their true character. Those who knew him use words such as intelligent, sharing, sharp and sincere to describe him and it seems he certainly made an impression on those he met at that conference. As he writes here, Ant named his brewery HayesenBrau, after his Dad's favourite beer Kronenbrau 1308. You can see some photos of his setup here. Very sadly, Ant took his own life on May 2nd 2011, leaving a wife and two children. An AHA forum post by his friend Jeff Renner (In Memorium, Ant Hayes, 1970-2011) announced this to a shocked home brewing community. Reading that thread tells you a lot about the man and the love and respect people had for him. London Amateur Brewers remembers Ant with an annual club competition, the HayesenBrau Award. This year, it was decided that the challenge would be to brew a beer (any style) that uses all of the following ingredients in any quantity - Pale malt (any British variety), Crystal and Chocolate malts, Target and Challenger hops and any British ale yeast. It seems only fitting to brew an English style, so I settled on a Porter. 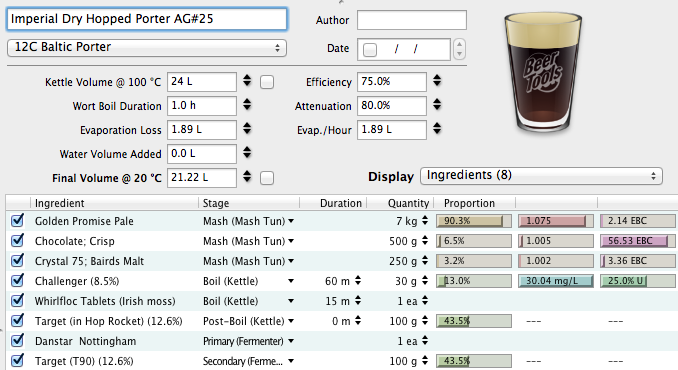 The aim was to make a big "Imperial Porter" and the above grist delivers a predicted OG of 1.082 (which was the actual OG). Danstar Nottingham is known for its high attenuation, which should put the finished beer somewhere around 9% ABV. I look forward to raising a glass to you, Ant. Update: The beer fermented down to 1.018, so is 8.5% ABV. It has a nice roasty flavour and aroma to it and hides the alcohol pretty well. I changed the dry hop to Challenger as I didn't have any Target T90.